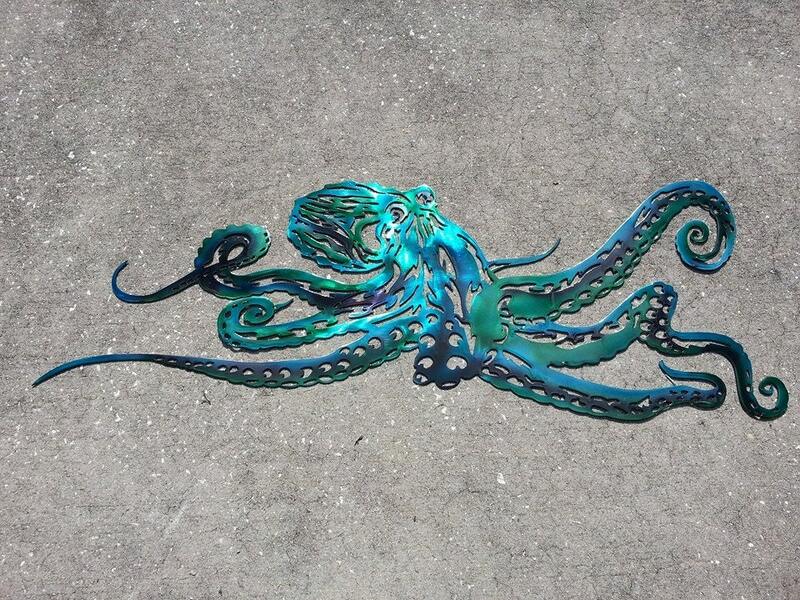 Our beautiful, airbrushed, and hand ground octopus is made from aluminum and is one of a kind! Finished by airbrushing and then powder coated with clear to protect the finish from oxidizing. No worry about keeping this outside, enjoy it anywhere. Each on of these is different and made to order. We will do our best to make your piece as close to the photos as possible, but please understand there may be differences. If you require certain colors in particular, please include a note with your purchase. I have 2 sizes listed but can make these in any size you request larger than 20". 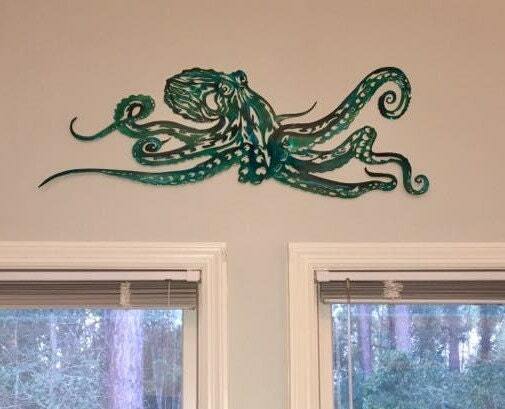 The 36" octopus is approximately 14" tall. This just added the perfect touch to my kitchen! Absolutely Perfect! I can't believe how wonderful this turned out!!! If I could give it 10 stars I would!! Love this octopus! The color is awesome! Super fast shipping. Very happy with this purchase. 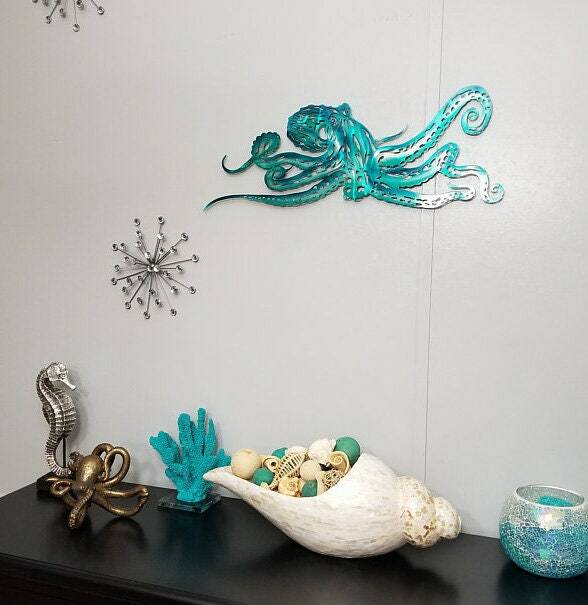 I received this octopus wall art from Theo and I'm totally blown away at how beautiful it is. This artist takes pride in his work as it really shows. The finishing on this sculpture was extremely well done. Every nook and cranny on the sculpture has been filed down cleanly. Even the back side of the sculpture has been finished off smoothly. The powder coating is also awesomely done and is a thing of beauty. If there were more than 5 stars I'd give more. Thanks Theo for working with me on getting the best shipping to Hawaii. Your communication is great. 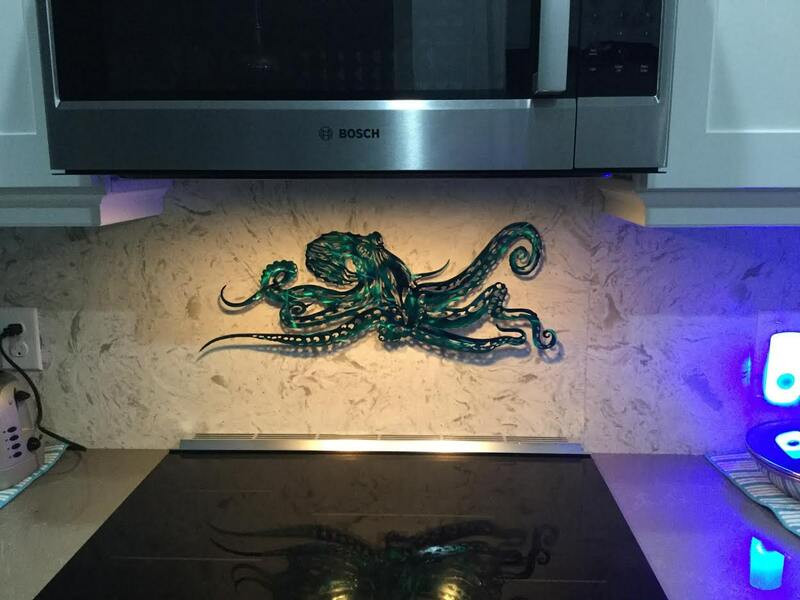 Got this octopus yesterday - it is BEAUTIFUL! And absolutely unique; a perfect centerpiece for our beach-themed bathroom. Thank you; you should be proud of your art! I plan on ordering other items as soon as I decide where I can put them!